When Patrick and Hailey meet a homeless veteran, the two take it upon themselves to do something about his situation. This brother and sister team up to make a difference in a really big way. Consulting with their parents and the pastor at their church they come up with a plan which will help the homeless people in their community. 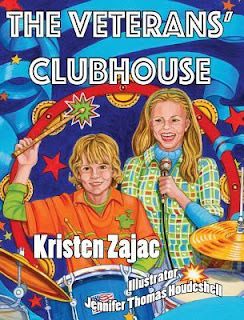 The Veterans' Clubhouse is a wonderful book which promotes compassion while teaching kids on many levels. Through teamwork, planning, self-sacrifice and compassion, a community comes together to help veterans find their way back to living, working and contributing to their own self sufficiency and well-being. This book, which is not another 'pie-in-the-sky do-good' rendering, is thoughtfully written and helps kids understand that in order to make a difference it can often require the efforts of many people. But the overall message is that kids really can make a difference. Wonderful illustrations by Jennifer Thomas Houdeshell help enhance this excellent book which is sure to promote and inspire altruism in youngsters. The Veteran's Clubhouse is highly recommended and has earned the Literary Classics Seal of Approval. Congratulations, Kristen! Keep it up!